Planning a move or recently bought a new home? Whether you’re moving in with your partner or to a new place, moving can be one of the most stressful experiences. With the countless to-do items, sheer volume of “stuff”, and the intensity of moving day itself, it’s no wonder people want to tear out their hair! But how can you make the move easy? I recently asked myself that same question! As I shared on my Instagram account, we just moved yesterday from a small one-bedroom condo to a two-storey home, so this advice is near and dear to my heart! After moving 4 times in the last 10 years, I’ve learned some tips and tricks for making the process less stressful, and more seamless. Here are some of my best suggestions. Getting everything out of your head and down on paper (or on your phone!) is a great first step in making the process feel more manageable. If you’ve started early, not everything on your to do list will need to get done right away. Add your to-dos to the calendar, set reminders on your phone, or use whatever other system works for you to space out and track your must-dos. This will let you tick off one or two items a week and make for a more seamless lead up. I use Asana for my to do lists and scheduling (both business and personal) but you may find the Calendar app on your phone or something physical like a planner to be a good space for tracking. When I first moved to Toronto, I used to buy cardboard moving boxes and packing supplies. They were expensive, often flimsy, susceptible to tearing, and a pain to store once I had moved in. Last year when I moved in with Curtis, I ordered Frogbox moving boxes (see my complete review here!) and it was a complete game changer. Frogbox delivers durable, reusable, eco-friendly moving boxes and supplies and then picks them up after you’ve moved. Their service is reliable and stress-free, allowing you to book online in a matter of clicks. Renting your moving boxes and opting for durable bins will save the headache of going out to buy boxes, makes packing much easier, reduces waste, and eliminates having to toss or store empty boxes at the end of the move. Frogbox has been kind enough to offer Beyond the Safe Harbor readers a unique promotion! Use code SAFEHARBOR for a free 50 square foot roll of recyclable bubble wrap, free 140 sheets of recycled packing paper, free delivery, and free pickup. This is available on orders of a minimum of a one bedroom kit. Labelling your moving boxes is another great way to stay organized. 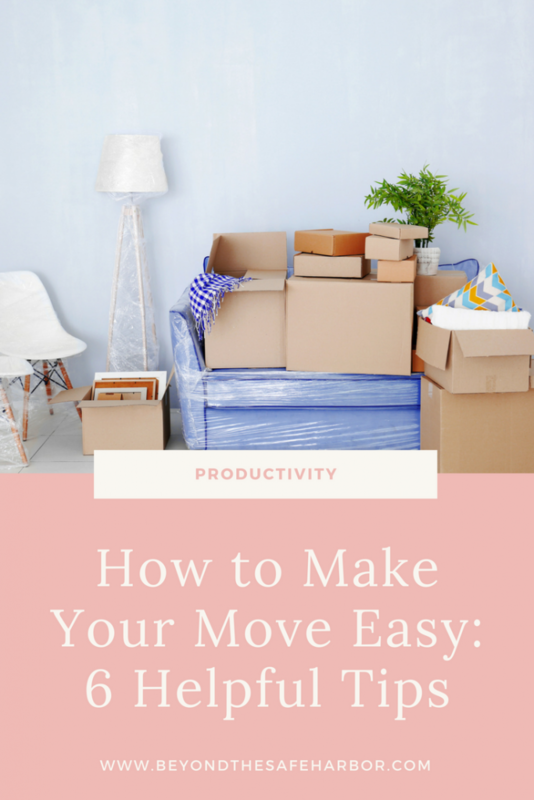 Not only will you have less lifting and carrying to do since you’ll be moving boxes to the right room the first time, but you’ll also save a lot of time. Packing can feel like a huge, overwhelming project, and it often is. As much as you can, split up your packing work. You can tackle one room each day, or even a few drawers at a time. The key is to go through your place in chunks so that each packing session is more focused, letting you avoid burnout. It also means you’ll be fresher and less likely to just throw everything in a box for the sake of getting it over with. It’s easy to get so caught up in the moving arrangements that we forget that we need time and space to unpack, clean, organize, and decorate. Build in some buffer time for these activities, including setting up any new furniture and decor. Moving into a new space is an exciting step, and the process of getting it all set up can be a fun one! I hope these tips help as you plan your next move. Wishing you a stress-free move and happy packing! Impressive blog! Packing your place for a move is nothing short of daunting, especially if you’re in a time-crunch or you tend to procrastinate.